Fall prevention. It's a big deal in senior living. When a resident falls, the costs can be significant for both the individual and the community. So it makes sense to have comprehensive programming that focuses on physical balance. And yet, whether we're consulting with a community or we've recently started managing their fitness program, it's really common to discover that even the most basic of opportunities to promote balance is missed when group fitness calendars lack dedicated balance classes. The reality is that a comprehensive strategy to improve resident's balance involves so much more than a group fitness class on the calendar, and that’s why we take an approach that is both broad and deep to help decrease fall risk for residents in both independent and assisted living environments. But we have to begin at the beginning, and that means adding dedicated balance classes. 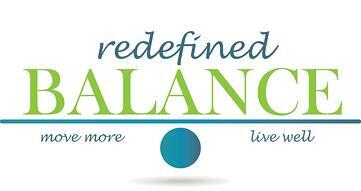 It's time to put dedicated balance classes on your calendar. It's not enough to address balance training as a 20 minute segment in your strength class. Your Tai Chi class also isn't comprehensively handling your resident's need for improving their balance. The physiological mechanisms that have to work together to achieve optimal balance are complicated and they warrant their own dedicated class on the calendar. Without fail, when we've started with a new client and brought balance into the program in a more bold fashion, that specific class fills up quickly. A dedicated balance program provide substantial benefit to residents to help increase their confidence, and it allows your community to stand with your brand promise for an vibrant living backed with safety and security that is second to none. In the last 15 years that we've been managing fitness centers in senior living communities, we've learned a lot about what works for the residents we're serving. Below are a few considerations as you look to enhance what you're offering. If your population supports it, offer different levels of balance class so that all participants can be continually challenged. 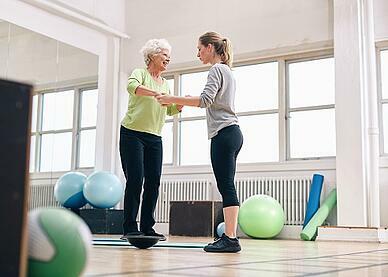 You likely work with residents who represent a range of physical capabilities; despite those differences, they all benefit from balance training, so build classes that can help even the most daring participants feel like they've worked hard. Consider the small equipment you have and how you can use it differently or commit small amount of the budget to buying additional items that will enhance balance classes. Balance pads, BOSU trainers, and weighted balls are all good additions. 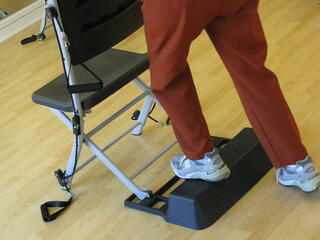 It’s not your typical march in place, balance on one foot and perform 10 squats type of class! It’s dynamic and just as mentally stimulating as it is physically for participants. If your fitness instructors or group class instructors aren't sure how to pull together a full class focused on balance, connect with us to find if consulting might benefit your exercise program.